Vintage clothing is in high demand. Several factors have contributed to vintage clothing’s soaring popularity including an appreciation of classic design, television period dramas such as Mad Men and Downton Abbey and an increased interest in environmental sustainability. Due to the demand, vintage garments in good condition, in particular pre-1950s garments, are becoming more difficult to find and more expensive to buy. You can find vintage clothing in a number of places from vintage clothes shops, vintage fairs, eBay and Etsy to the more obscure charity shops, flea markets and auctions. And then there’s your own home – yes! A rummage through your attic (or your parents’ or grandparents’) could yield some unexpected gems. While helping my mother clean out her attic over a year ago, I stumbled across more of my Great-Aunt Liz’s belongings. I had already inherited a few beautiful pieces from Liz which I talked about in this post. Apart from her wedding dress, I had no idea the items described below were tucked away in the dusty depths of the attic. 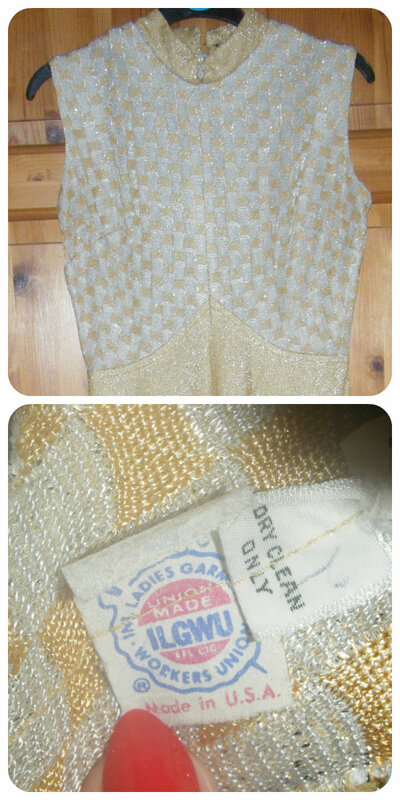 As much as I love vintage fashion, I’m no expert at dating vintage clothing. I’ve researched each item but I’d love my vintage savvy readers to give their thoughts and opinions. It was difficult to determine the date of this small bag as it’s unbranded and has no label. It seems beaded purses were the ultimate fashion accessory of the 20th century, enjoying huge popularity from the 1920s to the 1960s and beyond. This bag has a gold frame with a clasp closure. Cream and beige seed beads form an intricate design. Unfortunately some of the beads are missing and the lining is quite soiled. 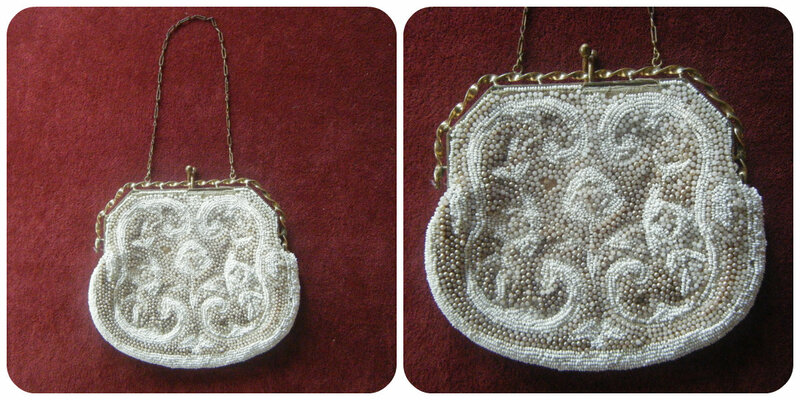 I’m guessing this dainty purse is 1940s/1950s. 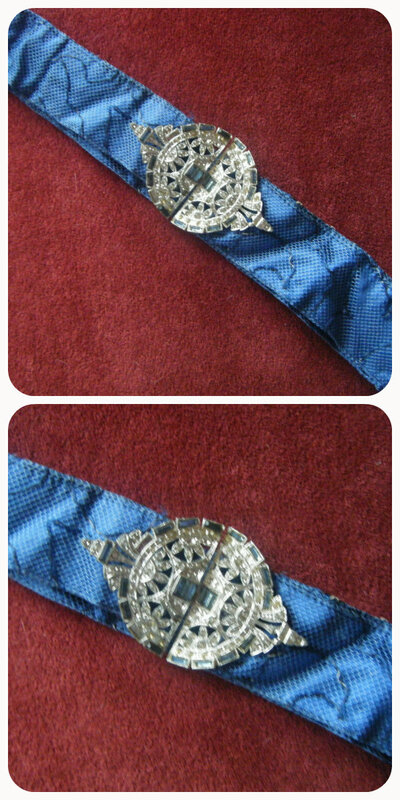 A jewel-encrusted silver clasp adorns this embroidered fabric belt. In my mind, I can see this cinching in a tailored jacket á la Christian Dior’s 1947 “New Look”. The silhouette of nipped-in waist and full skirt was a refreshing change from the frugal styles of World War II, greatly influencing 1950s fashion. 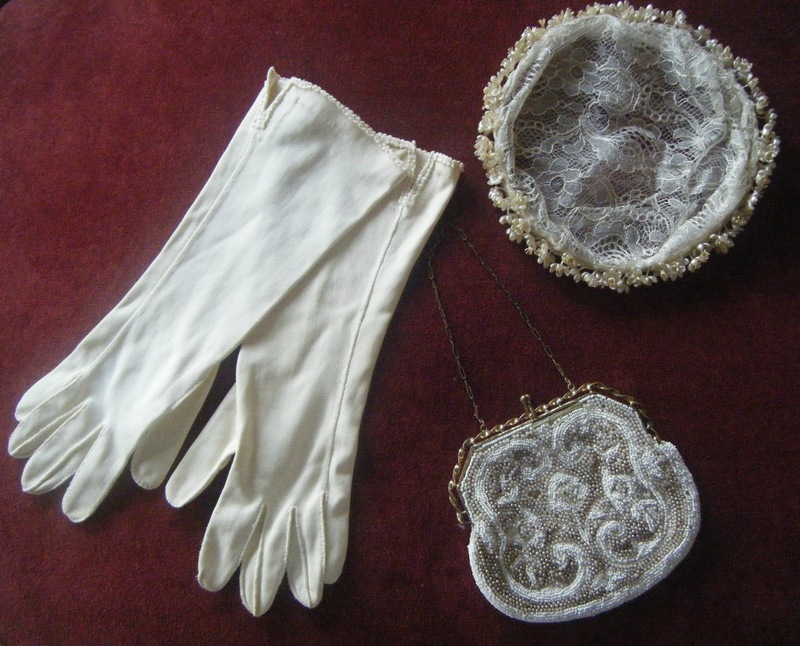 I wore these cream gloves to Ladies Day at the Dublin Horse Show last August (see post here). Their flared shape, which is called gauntlet style, was very popular in the 1950s. 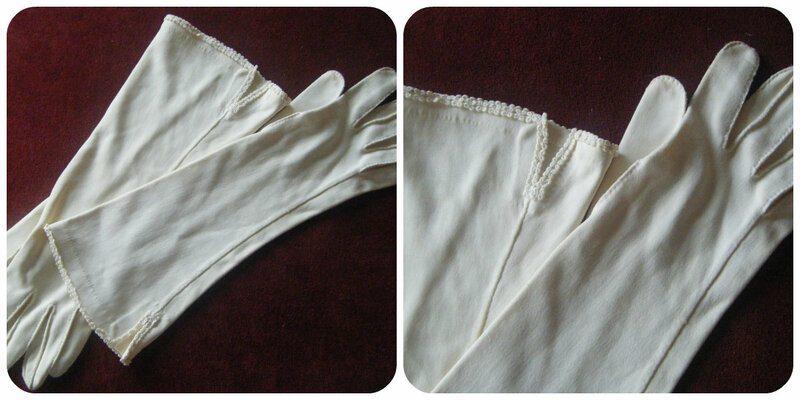 They’re in excellent condition and I adore the elegant detailing around the cuff. Jacqueline Kennedy Onassis (née Bouvier) is credited with resurrecting the Juliet cap. 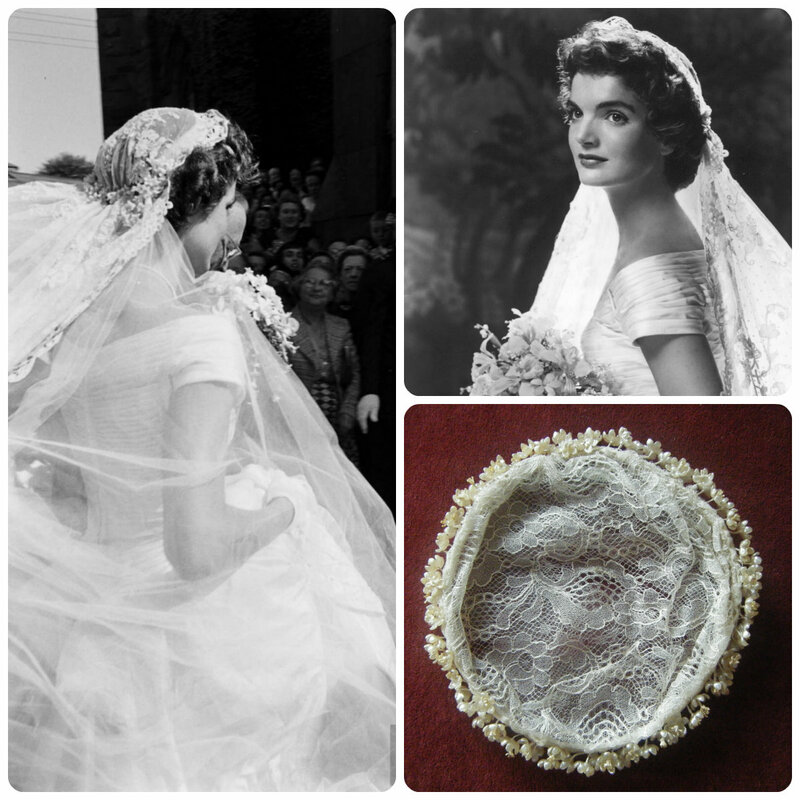 Juliet caps, small crocheted or mesh caps, were worn by brides throughout the 1920s and 30s but they became fashionable again when Jackie wore one for her 1953 wedding to John F. Kennedy. My Great-Aunt Liz got married in 1954; I’ve no idea if she was inspired by Jackie but I’d like to think she was. This Juliet cap is the only item of Liz’s wedding attire that’s survived. Unfortunately, her dress wasn’t stored correctly and was badly damaged. The dress, high-necked and long-sleeved, reminded me of another iconic mid-20th century bride. Grace Kelly’s gown worn during her wedding to Prince Rainier III of Monaco in 1956 is one of the best-remembered bridal gowns of all time. The bride also wore an elaborate headpiece. What a find! 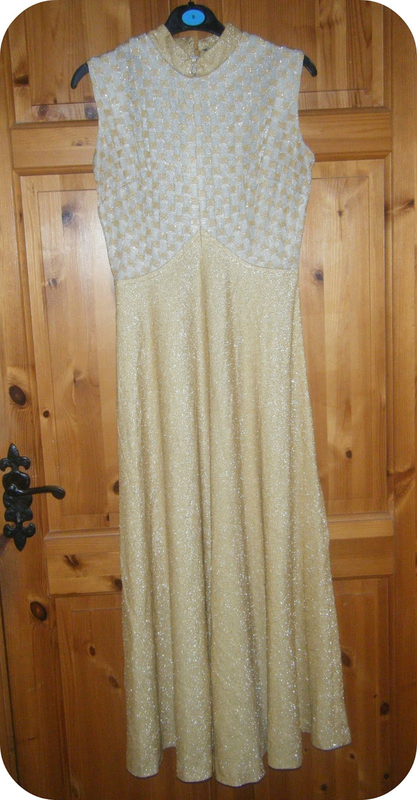 I was convinced this dress was from the 1960s due to the high neck and sleeveless style. However, on closer inspection I found a distinctive ILGWU (International Ladies' Garment Workers' Union) label. The union changed the design of its label numerous times since its formation in 1900, making it easier for vintage lovers to identify the general era an item was made. According to the Vintage Fashion Guild, this dress is post 1974. In 1974, ILGWU decided to change the colours of its label to red, white and blue with the addition of the line 'Made in U.S.A.’. This was part of a campaign to encourage American consumers not to buy imported goods. The label was changed again in 1995 when the ILGWU merged with another union, the Amalgamated Clothing and Textile Workers Union, to form UNITE. Now who’s going treasure hunting?! What absolutely wonderful finds! The gown is spectacular. I remember finding photos of my gran in the 50s and being so sad I couldn't get my hands on any of her clothes - ditto my mum in the 70s! It's so beautiful Emma! I know how you feel, as a child I laughed at photos of my mother in flares and halter neck tops...now I want to wear them! 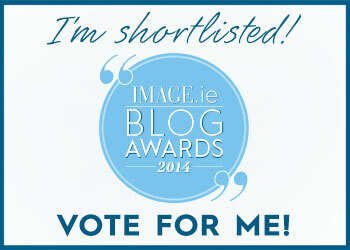 Shortlisted For Best Lifestyle Blog!